In fact I saw the first female a couple of days ago. Really nice image Karl. Very difficult to get these so sharp in flight coming right at you. Superb technique. I've tried this quite a few times and it isn't easy. I've only had one partially successful attempt. Great view of the epaulets, Karl. One of my favorite birds to capture in flight. Karl, Good one. We've had lots of Female Red-winged Blackbirds in South Texas, but very few males. Sometimes the males will travel together and the females travel together. Not sure if that is the case this year. Killer pose... nice flight work. 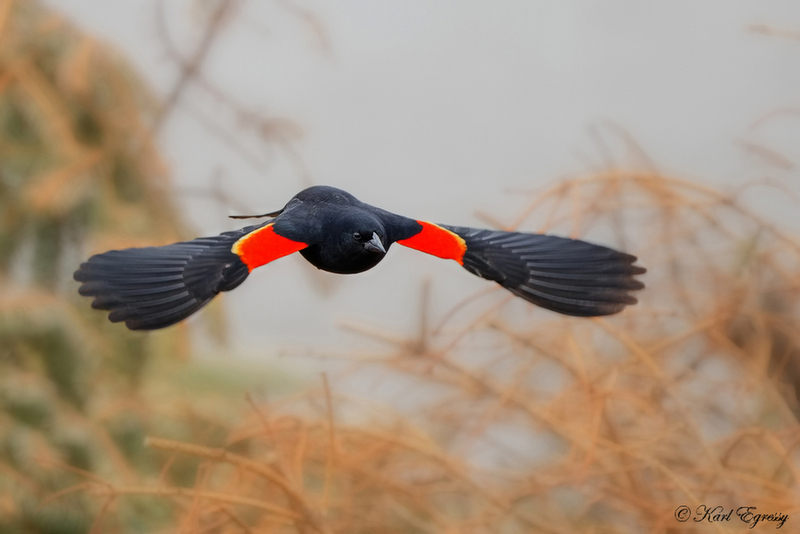 A handsome, attention-grabbing approach shot with the striking red and black contrast in the wings. Great image, Karl. a beauty of a shot, well done KARL. Nice wing spread. I love these guys when singing and flashing those red patches. Wonderful shot Karl! I love the head on approach that gives us a perfect view of the red wings. Beautifully done!